Gurgaon: The Kala Academy of Goa has picked Gurgaon-based Lorraine Music Academy to present a musical evening in Panjim on January 4. The event will comprise performances by eminent Scottish musicians like Fali Pavri and Naomi Boole-Masterson, who will play compositions of legendary composers Chopin, Rachmaninov, Field, Schumann, Ginastara and John Mayer. Kala Academy, Goa in association with Lorraine Music Academy has organized programme titled ‘A Musical Evening’ with musicians Fali Pavri (Piano), Naomi Boole-Masterson (Cello) and Lorraine Fiona Aloysius (Piano) on January 4 at 6:30pm at the Dinanath Mangeshkar Kala Mandir, Panaji. 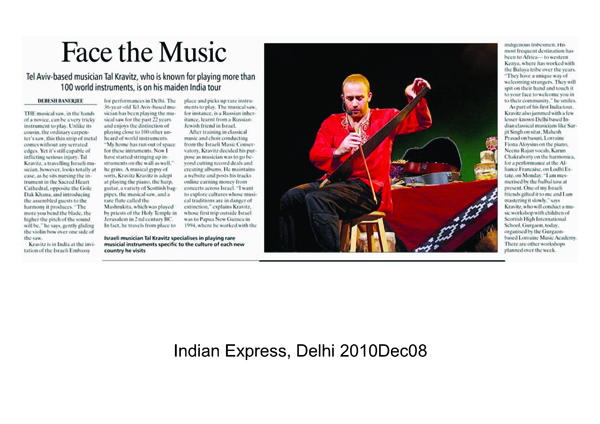 He plays the flute from his nose and can make even a matchbox and a wood-cutting saw produce the most melodious music. Israeli musician and singer Tal Kravitz, as part of his India tour, entertained the royal audience at the Israel Ambassador’s residence recently.